This thread is GREAT! I've been wondering how well some of those BAFs would scale with the MU figures. Thanks for the pics....and ideas on other stuff. I like the 3 3/4" Venom from the Spiderman line, but I think the Stinger version from the 6" line works rather well with MU Spidey too; it's much more imposing. Last edited by Th0r4z1n3; 05-07-2012 at 06:13 PM.. I can post some later. Master Mold was released in the '90s. 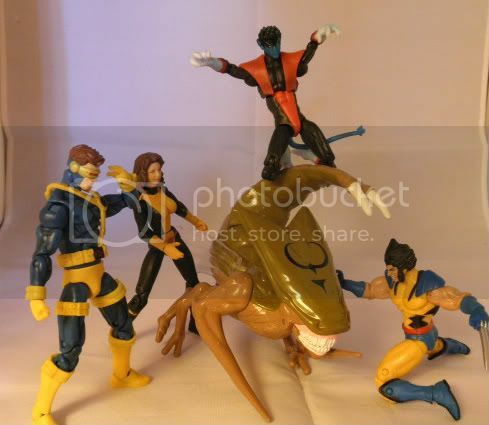 It was part of the X-men Secret Weapon Force Power Slammers line, which was just a specific lineup of figures from the ToyBiz line of X-Men figures. Does any one know how the ML Brood Queen matches up to the 3.75" figs? It would really be a bit on the big side. I recommend the old toy biz Brood warrior for the queen, it scales great with MU. Then the heroclix Brood can be the regular Brood warriors. Best part is they can be had easily for $5-7 bucks on Ebay. I have about 6, and I've gotten them for as little as $2 on the 'Bay. I have two from my collection in the 90's. I think I have one MOC too. Thanks for the tip and the pic Hank. You're good to go then, bro! I think a little dark paint wash to bring out the details and dull out the glossyy plastic and they'll be ace! The new Batman 3 3/4 are in scale. The arms have no articulation at the elbow. This thread hasn't been updated lately. I'm planning on working on a huge diorama project for the summer..something like these for my MU collection. I was thinking of having a designated area with a Glacial region for Yodenheim where I could put my frost giants, a medieval castle area, and urban setting...almost as if shattered space and time appeal where everyone's essentially going at it. I just need recommendations of what and where to get playsets, accessories, effect pieces, vehicles, vending machines that work well in this scale. If you guys have anymore ideas, just throw em at me and that would be awesome! and sorry for linking youtube vids, im not sure if i'm allowed to do that! Im looking for something for our Skrulls.... maybe Star Wars but I dont want it to look like it is Star Wars.... something 'spacey' be iit a playset or a vehicle. I think EVERY army needs a vehicle or playset to finish the look. Last edited by ukmu; 05-11-2014 at 07:44 AM..
there is/was a space centric line that was a exclusive to toysrus(it wa sin the same aisle with all the True Heroes stuff). They had a space ship that might work. 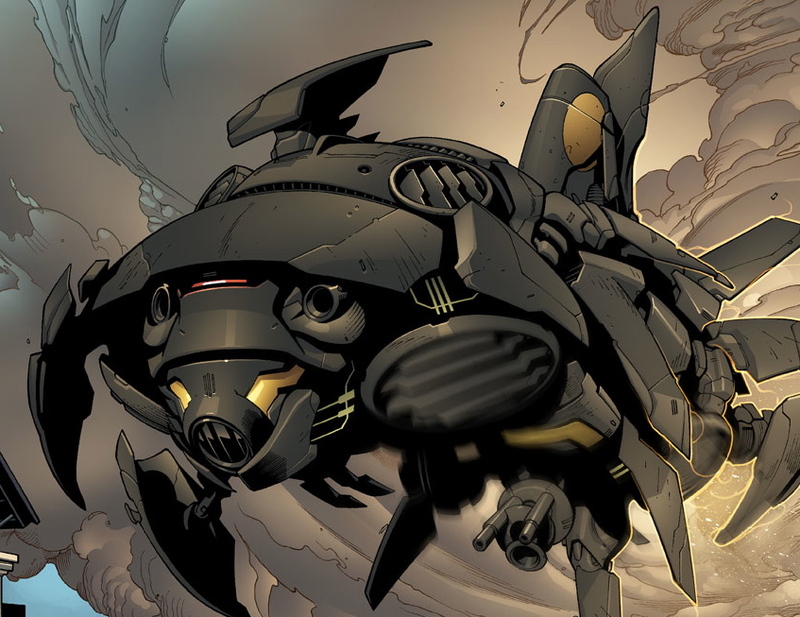 A ship for the skrulls would be awesome! If I had the space or enough hydras, I'd have a line up of 50 ready to attack...you guys have any ideas for dios or how to make em? Bmorr, your dio looks awesome btw! Any vehicle in 1:18 scale works, Maisto makes some great Harleys for Ghost Rider, or any character you feel needs a Harley. Thanks! holy crap this is gonna be a costly project...what helicopters would work? I find 1:18 looks too small - not badly so, but noticeable. Problem is, most action figures are about 4 inches now (MU and Joe at least), so they're much closer to 1:16 in scale. 4" for MU is 1:18 scale. Almost every character is listed as being around 6' which is 72", 4:72 is equivalent to 1:18. You can use whatever scale you prefer, since not every figure figure even follows the scale (Moon Knight is 6'2" yet his MU figure is shorter than the Wolverine Astonishing version, Wolverine is 5'3"). I use a 1:18 scale Maisto Harley for Ghost Rider and it works great, though this may not be true for every single vehicle claiming 1:18 scale typically it works well enough. Those dios look awesome. Does anyone have a MOTUC castle gray skull with some MU figs for scale? I would love to get one for my castle doomstadt or villain chillin pad. It's just too expensive if it's not in the right scale. I know it's supposed to be 7" scale but I've been wondering if it's compatible? the vintage stuff goes for cheap sometimes and the scale might be better. Las Vegas strip! make it huge with lights, a pyramid, a castle alleys buildings fountains, a crashed hellicarier, alien invasion. In my head it looks nuts. you got me there kylactus. not a bad a idea at all..